Japan has one of the highest cremation rates in the world with the country reporting a cremation rate of 99.85% in 2008. The cremation rate in the United Kingdom has been increasing steadily with the national average rate rising from 34.70% in 1960 to 72.44% in 2008. The cremation rate in Canada has been increasing steadily with the national average rate rising from 5.89% in 1970 to 68.4% in 2009. The rates vary greatly among the provinces with the most recent (1999) province level statistics showing that British Columbia had the highest rate at 74% while Prince Edward Islandhad the lowest rate at 8.5%. The cremation rate in the United States has been increasing steadily with the national average rate rising from 24.10% in 1998 to 36.86% in 2009 and projections from the National Funeral Directors Association forecasting a rate of 46.04% in 2015 and 58.85% in 2025. The rates vary considerably among the states with the highest rates (over 60%) being reported in the Western United States with the lowest rates (under 25%) being reported in the Southern United States. 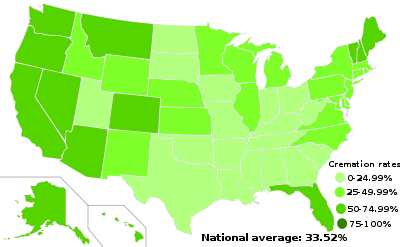 The following table lists the 2006 cremation rate for each state including the national average. The cremation rate in Australia is quite high, being similar to other English speaking countries like Canada. Records show that slightly over 65% of all deaths were cremated in 2008. New Zealand's rate is slightly higher than Australia's, with 70% of all deaths being cremations in 2008.